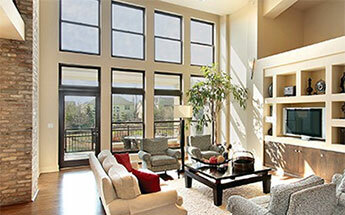 For great, high-quality tint, turn to your LLumar home window tint dealer in Raleigh. Make your home a more enjoyable place to be, especially in the hotter months, and help lower your energy expenses with home window tinting. For more than 60 years, LLumar's home window tints have provided homeowners with protection from the sun’s heat and harmful rays. Today, we continue to help people live comfortably in their homes, whether in an apartment, condo, or house! At your home window tinting dealer, you'll find that our specially trained technicians have been handpicked to provide you with a great experience. Contact your Raleigh home window tinting dealer for a fast, free, and easy tinting estimate today! When one of our expert technicians in Raleigh installs your home window tint, your family is better protected from the sun’s harmful ultraviolet rays, but also from the prying eyes of would-be burglars depending on the tint you choose. Tint the windows in your home to help prevent the fading of treasured artwork, family furnishings, wallpaper, paint, and more by the sun's destructive rays. And did you know? It helps block up to 99% of the ultraviolet rays that cause discoloration and fading. In warmer months, it could help keep your house cooler and more comfortable. And guess what? Many customers have reported seeing a decrease in their home energy expenses by up to 15% after their home’s window tint was installed! Since LLumar is LEED-certified, you could be eligible to save even more money through tax credits and incentives.